Identify within context a variety of appropriate sentence-combining techniques (e.g., comma + coordinating conjunction, use of semi-colon, and introductory phrases or clauses). Semicolons in Compound Sentences - Use a semicolon to separate independent clauses in a compound sentence. Using Colons Effectively - Click on " The sentence, please! " and a sentence to edit will appear in the top text-area . Complete a graphic organizer (clustering, listing, mapping, and webbing) with information from notes for writing a writing selection. Bibliographic Blunders (6-8) use note cards to collect information. Select appropriate transitional devices or time order words to enhance the flow of the writing. Transitional Devices - transitional guides are connectives (symbols,words, phrases; sometimes whole sentences and paragraphs) that make possible a smooth "passing over" from one idea to the next. Identify the purpose for writing (e.g., to inform, describe, explain, and persuade). Critical Reasoning Warm-ups - (Scroll down, it's there!) These are warm-ups for people who are somewhat familiar with critical reasoning questions. These questions are a good way to start your brain thinking before you answer the real questions. Identify the targeted audience for a selected passage. Information Elimination (6-8) model, instruct, and practice narrowing a topic for expository writing. Irrelevance Quiz - Click on the sentences that are irrelevant. those in the spaces provided. Straying off the point - Identify which sentences are not connected to the main focus of the paragraph. Integrate all steps of the writing process: prewriting, drafting, revising, editing, and publishing. Prewriting Tactics (6-8) organize and group related ideas. Identify levels of reliability among resources (e.g., eyewitness account, newspaper account, supermarket tabloid account, and internet source). Quality Information Checklist - Here are eight ways of checking information on web sites. TV News Magazines and the Credibility Issue: The Scope of the Problem - article about reliability. Select an appropriate thesis statement for a writing selection. Select the most appropriate title for a passage. Select illustrations, explanations, anecdotes, descriptions, and/or facts to support key ideas. Choose the supporting sentence that best fits the context and flow of ideas in a paragraph. 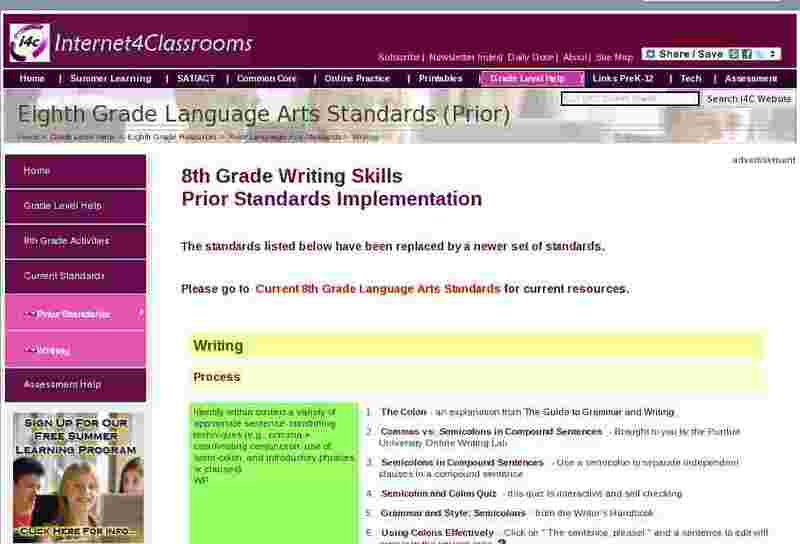 Revise and edit writing for elements of language. Power Proofreading - Choose your level of skill and your areas of concepts to practice with an interactive activity (choose grade 8) There are over two dozen different passages to choose from. Use precise language including active verbs, vivid words, colorful modifiers, figurative language, imagery, and experiment with incorporating allusion. Select vivid words to strengthen a description (adjective or adverb) within a writing sample or passage. Compose clear and correctly punctuated complex sentences to vary sentence structure. Quotation Marks - In the United States, periods and commas go inside quotation marks regardless of logic. Demonstrate facility in the use of language. Support thesis with elaboration, using supporting details, supporting examples, and/or anecdotes. Developing Paragraphs - ideas and activities on how to elaborate paragraphs. Guide to Writing Academic Essays - Guide to help support one's thesis. Outline - Outline of how to create a thesis. Write engaging introductory paragraphs and strong and clinching concluding paragraphs. Trailblazing Introductions (6-8) Students develop a sense of beginning by using strong leads. Trailblazing Conclusions (6-8) Students develop a sense of ending by using closure and thought-provoking statements. Write well-developed, organized, and coherent essays in response to expository prompts. Expository prompts - prompts that have personal connections between the writer and their ideas. The Expository Essay - Sample essays to study. Writing Expository Introductions and Conclusions - Do's and don'ts of introductions and conclusions. Quiz - identify the following types of paragraphs: expository, narrative, persuasive, and descriptive. Quiz - match a prompt to narrative, expository, persuasive, or descriptive writing.